We would like to take a moment to say Thank You for being with us on our special day. Our ceremony went exactly as planned and your words were so wonderful. Again thank you for taking part in our wedding. 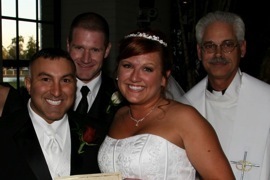 My wife and I would like to say that retaining the Reverend Giovanni to perform our marriage was one of the best decisions of our wedding that we could have made and it was not only my wife and I that felt that way. Virtually everyone who attended agreed. The Reverend Giovanni is an absolutely wonderful person to work with. He insured that he followed up on our meetings insured that he took his time to review all of our choices and did not hesitate to explain to us why he felt that something that we picked may not be appropriate to what we had said that we wanted. The Reverend Giovanni indeed captured our essence and because of him the wedding made a definite statement about how my wife and I felt about each other. Clearly, his years of experience has given him multitudes of ideas and his creativity is never ending. The Reverend Giovanni was serious when the ceremony called for such seriousness but definitely placed us and the attendants at ease with his wonderful sense of humor and timing. Lastly, his charges are more than reasonable. For anyone searching for a Reverend to perform their wedding there is no better choice than the Reverend Giovanni. They can be assured that the ceremony will be performed to perfection. James and I would like to thank you again for a wonderful job you did on our wedding day. The ceremony was perfect. We both greatly appreciated how professional, reliable, organized and lighthearted you were. We still have guests commenting on our ceremony and how nice it was . We loved how you incorporated some humor as well as a few moments that tugged on the heart strings of our guests. We will definitely recommend you to anyone and everyone that we know who is getting married. Everyone stresses about their wedding day and worries about things that may go wrong. Lucky for us, we had someone who was knowledgeable and able to answer all of our questions and help us create a ceremony that fit us perfectly. Our ceremony was beautiful and you helped us make it that way. Everything looks great and I am already emotional reading it [the vows]. I am going to be a mess at the wedding. The ceremony sounds wonderful.